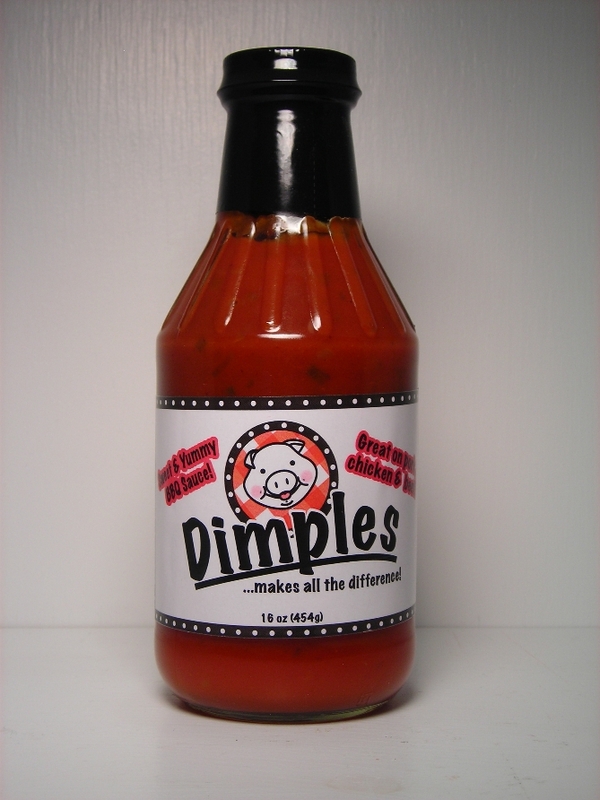 Dimples BBQ sauce is a sweet, tangy tomato based sauce produced in Raleigh, NC. Dimples is the creation of BBQ competitor, Rich Campana. Rich originally concocted the recipe to for use by his competition team, Kings of Q. After the team decided to go a different route, Rich and his wife decided to bottle and sell their sauce in January of 2011. They named their sauce Dimples after a family trait shared by Campana men, the dimpled chin. The medium-thin sauce is bright red and brushes beautifully on meat. I used Dimples on BBQ chicken thighs. The sauce gave the chicken a beautiful glossy red shine. The sauce also works great as a dip for just about any kind of BBQ. Originally from Chicago, Rich combined his Midwestern sweet tomato based roots with the tangy vinegar BBQ culture of the Carolinas. The result is a unique sauce that doesn't quite fit into any particular category. I love these types of transitional sauces. In an area like North Carolina, it takes inventiveness and a little bit of courage to step outside a very narrow traditional view of BBQ sauce. By successfully balancing sweet tomatoes and tangy vinegar, Dimples is a sauce that most everyone can enjoy. Many newcomers to the Carolinas find the vinegar sauces overwhelming in comparison to the sweet, mild sauces that they're used to. For anyone looking to introduce a newbie to Carolina Q, Dimples would be the perfect starting point. Rather than throwing them into the deep end with a spicy Eastern style sauce, it may be best to let them dip their toes (so to speak) into the world of vinegar sauces first. Dimples is the best blended style sauce that I've tried yet. Dimples has only been around for a year, but their popularity is spreading (300+ likes already on Facebook). With a sauce this good it's easy to understand. I highly recommend Dimples BBQ sauce for chicken, brisket or pulled pork. In fact, the sauce's texture and flavor are versatile enough for nearly anything you want to throw on the grill. 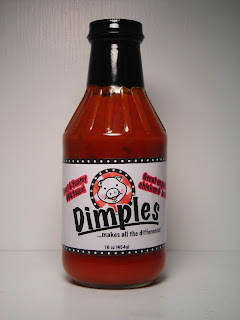 Dimples BBQ sauce is currently available in several retail stores in the Raleigh area. It can also be purchased online. Click the title of this review to view the Dimples website. Check the "Product Reviews" page to see how Dimples compares to other BBQ sauce. 1 Response to "Dimples BBQ Sauce"
It is a very nice sweet sauce. My two year old loved it. I should have bought more.